You see a small sign like smoke from a mountain top but behind this there may be a volcano. Or when looking at an iceberg you only see the tip. 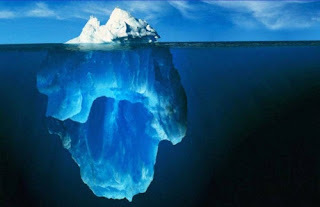 Most of the iceberg is not visible. Similarly, we are aware of a very small part of ourselves but there are many facts behind this. We have to understand the total situation, not just a small part of it. It is like the light of a bulb which illuminates a certain area but a vast area remains dark. What happens in this area is important but not clear. In our case what happens in the poorly lit area is very important. For example we often get annoyed or irritated. Now, this is a sort of feeling that is at the back of our mind. It is not totally forgotten. Sometimes this feeling gets strong and explodes. One man lived in a house that had a wooden ceiling. Every day a neighbour living above his room arrived very late at night, removed his shoes and dropped them heavily on the floor making a loud noise. The man below went up to the inconsiderate neighbour and told him that he was awakened by his action. He did not get angry and he did not shout. The next night, the man was waiting for the arrival of the man above. He heard the man come and the loud noise as the man removed and threw his shoe. He waited for the sound of the second shoe as it dropped. However, this did not happen. He waited a long time but the noise of the second shoe did not come. He lost his temper and stormed up to the man’s room shouting “You fool, why don’t you drop the second shoe”? The neighbour was surprised. He said, “Friend, when I came in I had forgotten that the noise disturbed you and threw one shoe, which made a loud noise. But I remembered on hearing the sound myself. So I put down the second shoe very carefully”. Our subconscious feelings are not very often consciously expressed. In yoga, we work on this problem of our unconscious mind by seeing that we consciously create good thoughts and feelings. If our conscious mind is good, healthy and cheerful then the memories of this are also good and healthy. If this happens there are no fears of the bad subconscious explosions. Published in the December 2011 edition of Yoga & Total Health Magazine.